Our fire fighting pump is a Davey Firefighter 5 with electric start. 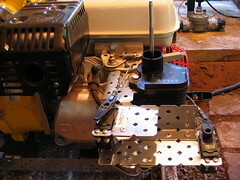 The Honda GX200 engine is great, starts first time every time. Even when left all winter it starts on the first kick. I highly recommend this pump. Our neighbours have a Davey Firefigher+ 5 and highly recommended it. Our house is not very high, so we do not the higher pressure of the Firefighter 5+. The high flow rate (up to 500lpm) is good for an EWSS or for running multiple fire hoses. The fairly constant, moderate (around 400-700kpa), pressure puts less stress on pipes, hoses, and makes for easier control. We wanted electric start so we could remote start it from work. 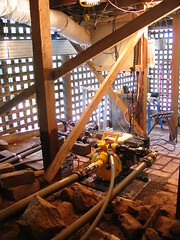 To remotely start the pump I needed to connect into the electrical start and stop. Fortunately the pump came with a good electrical diagram and the cables have connection inside a plastic sleeve on the right of the pump near the start motor. See photo below. 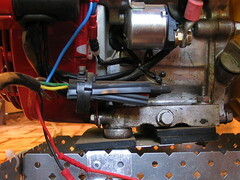 Throttle and choke are controlled via two servos used for radio control models. See photo below.